Coverage is activated when you have paid for the full transportation fare for your trip with your RBC credit card and/or RBC Rewards points prior to commencing your trip. Personal property and gifts purchased using your RBC Visa Infinite Avion card and/or RBC Rewards points are insured against all risks of direct accidental physical loss or damage for 90 days from the date of purchase. If you paid for the personal property or gift using your RBC Rewards points, you are insured for the amount of RBC Rewards points you redeemed to pay for your purchase. 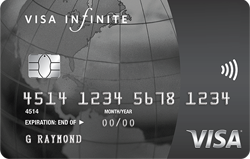 Note: The maximum amount of coverage is $50,000 (or the equivalent number of RBC Rewards points) per RBC Visa Infinite Avion account for each year. Items covered by Extended Warranty Insurance must have been purchased using your RBC Visa Infinite Avion card and/or RBC Rewards points. If, before your scheduled departure, you are required to cancel your trip due to a covered reason for cancellation, you will be reimbursed up to $1,500 per person, to an overall maximum of $5,000 per trip for the non-refundable portion of your prepaid travel arrangements. You, your spouse and dependent children, as well as up to 3 travelling companions, are all eligible to receive benefits under this insurance when the full cost of the trip is paid for with your RBC Visa Infinite Avion and/or RBC Rewards points. Cancel your trip no later than the next business day following the cause of cancellation and call Assured Assistance at 1-800-533-2778 immediately to receive the necessary claims assistance. If you do not call Assured Assistance, you must notify the RBC Insurance Claims Center at 1-800-464-3211 within 30 days of the date of the cause of cancellation to obtain a claim form. You, your spouse and dependent children, as well as up to 3 travelling companion are all eligible to receive benefits under this insurance when the full cost of the trip is paid for with your RBC Visa Infinite Avion and/or RBC Rewards points. This insurance is effective when the full cost of your airline ticket is paid with your RBC Visa Infinite Avion card and/or RBC Rewards points, and your luggage is checked with that airline. Coverage begins at the actual time you check into your hotel room, motel room, or cruise cabin, provided that your hotel room, motel room, or cruise cabin is paid with your RBC Visa Infinite Avion card and/or RBC Rewards points.